Paraguay's lawmakers voted on August 2 in favour of the Financial Rehabilitation bill to support small farmers overwhelmed by debts. The farmers, who have been holding protests for three weeks in the capital Asuncion, brought the city to a standstill once more prior to the vote. The legislation, introduced by the progressive Guasu Front, will fund and restructure the debts of small farmers who own less than 30 hectares of land with subsidies of up to US$10,000 a person. Thousands of landless workers marched on July 12 through the streets of the Paraguayan capital, Asuncion, to demand the cancellation of debts contracted with the national bank. The demonstrators have been blocking the centre of the capital since July 10, setting up their camp in front of the National Congress. A wave of popular protests and strikes rocked Paraguay on November 3 as popular discontent with the national government approached breaking point. High school students, teachers, public transport workers and health sector workers held strikes and marches protesting government policies. There’s a new president in Latin America, and his name isn’t Nicolas Maduro. The election that brought him to power was called by an illegitimate regime following a coup d’etat, and his name isn’t Porfirio Lobo. He’s a wealthy, conservative businessman, and his name isn’t Sebastian Pinera. His party ruled for over 60 years, and his name isn’t Enrique Pena Nieto. 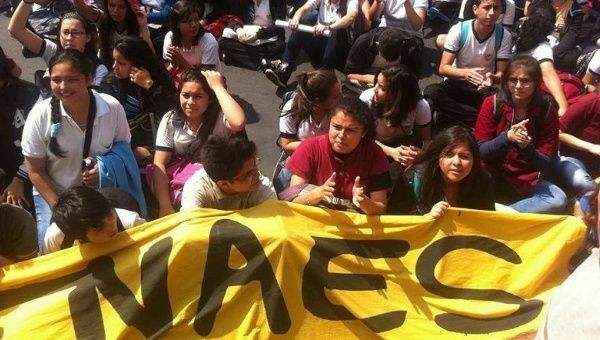 About 300 students from the Paraguayan National University and the private Catholic University marched to the national police headquarters in Asuncion on October 25 to protest the new Law of Higher Education (LES). The law passed through the lower house of the Paraguayan Congress three weeks earlier, and is currently before the Upper House. During the protest, Romilio Gonzalez and Johana Orihuela, members of the Popular University Movement, spoke to Green Left Weekly. “This is one of a number of actions we are carrying out,” Orihuela said. In a show of force, about 10,000 supporters of the Frente Guasu attended a rally addressed by the party’s leader, ex-president of Paraguay Fernando Lugo, in the regional city of Coronel Ovideo on October 25. Lugo was deposed in June in a parliamentary coup. Lugo's removal was organised by right-wing forces opposed to progressive changes that threatening to challenge the interests of the traditional oligarchy and US imperialism. In a speech marking the one month anniversary of the parliamentary coup that overthrow left-leaning Paraguayan President Fernando Lugo, the ousted leader said on July 22 that a motivating interest for the coup-plotters was a sought-after deal between Paraguay and Montreal-based mining company, Rio Tinto Alcan (RTA). “Those who pushed for the coup are those who want to solidify the negotiations with the multinational Rio Tinto Alcan, betraying the energetic sovereignty and interests of our country,” Lugo told supporters. The June 22 coup carried out against Paraguayan President Fernando Lugo was an important blow to progressive movements across Latin America. Whether Paraguay's infamously right-wing local oligarchy and its parties that seized an opportunity to bring left-leaning President Fernando Lugo down by itself, or whether the push came from the United States government, is yet to be confirmed.